Kigali — Regional, agro-scientists have embarked on a research project to develop cassava varieties with resistance to the two most dangerous diseases that hamper cassava production in eastern and southern Africa; Cassava Brown Streak Disease (CBSD) and Cassava Mosaic Disease (CMD). The new cassava breed being developed has been dubbed; "double resistance cassava." Announcing the progress after four year advanced trials in Uganda, Agro scientist Edward Kanju, at the Institute of Tropical Agriculture (IITA), said that there are 14 types of the crop under research that are very promising. "I am very excited with the results of the trials," he said. "Out of the 40 types of cassava under trial, 8 did not show any disease symptoms and 6 had very mild symptoms, either on the roots or leaves or both," Kanju says. According to Kanju, the findings will be followed by disease exposure for further testing. "This is a very severe test for establishing disease resistance and if they don't show any signs afterwards, then we can confidently, and for the first time say we have cassava varieties that are resistant to both CBSD and CMD," Kanju said. 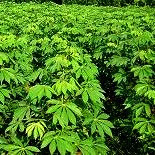 Subsequently, the cassava plants will be tested in other countries that include; Rwanda, Tanzania, Kenya, and DR Congo. Currently breeding for dual-resistant cassava is being conducted in Tanzania and DR Congo. Jigawa State executive council has approved the sum ofN22.8million for the establishment of cassava processing campany at Gwaram Local Government Area of the state. The Commissioner of Information, Alhaji Aminu Muhammad, disclosed this while briefing newsmen on the outcome of the state executive council meeting yesterday. He said the establishment of the company is part of the overwhelming commitment of the state government on poverty eradication by empowering people through improving their job opportunities. The commissioner revealed that the state government took the decision following the visit paid by the deputy governor to China, where he discussed with a company producing machines for cassava processing. The construction of the new company is expected to take off early September this year, and when completed, it would assist farmers in the state to boost their cassava production. He noted that government has also decided to site the company at Gwaram Local Government Area considering the abundant cassava in the area and by extension, the greater part of the state, pointing out that it would reduce the volume of wastages of the product when established. Aminu added that the company’s bye-products would include cassava flour, Garri as well as extracting starch, and would serve as a source of revenue to government and source of job to the teeming youths in the state. Creativity, it often appears in the current critical situation. Cassava, a commodity not long since in a matter of business of agriculture, has become the object of creativity after the food crisis and energy had whip this country. In the field of food, cassava as a commodity even encouraged diversification into a new strength to stem the import wheat. While in the field of energy, cassava can be used as raw materials bioenergi, to reduce the use of petroleum that can not diminish the update. With several times the processing, cassava is the best potential to become food commodity and energy diversification. A number of practices that result in a value-added cassava is already in the can find in some places. In general, the effort that can only be on a limited scale. At the macro level, not to create a climate conducive to truly improve the economic value of cassava, to a more established level. Moreover, after the food crisis and energy is already menjauh, because abundant rice production and oil prices go down. Cassava is only to be excellent in the time away. In fact, in the long term, food crisis and energy need to be considered. Abuja, The Common Fund for Commodities through its technical partner in Nigeria, Farm and Infrastructure Foundation has embarked on the distribution of cassava seedlings (419 types) to farmers in Mararaba, Nassarawa state. A statement from the Ministry of Commerce and Industry said the cassava project is a pilot programme being financed and supported by the Common Fund for Commodities, an Intergovernmental financial institution established within the framework of the United Nations Headquarters in Amsterdam, Netherlands. Representative of Farm and infrastructure,Mrs. Toyin Adetunji explained that the project was meant to upgrade traditional cassava products for urban markets and the development of industrial marketing channels for processed cassava products as a low cost substitute for wheat that would provide realistic opportunities for Nigerian Small holder farmers and processors. The team pointed out that it is expected to lead to the development of supply lines for High Quality Cassava Flour (HQCF) for bakery and confectionary markets as well as improve the competitiveness of garri and increase income opportunities for small processors. According to statistics from the Food and Agriculture Organization of the United Nations (FAO), worldwide production of cassava roots in 2005 amounted to 45 million metric tones and up to 49 MT as at 2007 while Africa accounted for 50% of global production. This project intends to develop and promote efforts on selected regional markets in Benin, Nigeria and Sierra Leone where cassava could effectively compete with cereals. The projecting executing agencies are Common Fund for Commodities, Federal Ministry of Commerce and Industry, FAO,Cassava Processors Association of Nigeria (CAPAN), Cassava Equipment Fabricators Association of Nigeria (CEFAN) with the Farm and Infrastructure Foundation providing the technical backup. Philippine, BASIC ENERGY CORP. IS SET TO begin a feasibility study for its planned cassava-based bioethanol plant, which will have a capacity of 100 million liters a year. In a disclosure to the Philippine Stock Exchange, Basic Energy compliance officer Angel P. Gahol said the company’s board of directors has authorized management to sign a contract for the conduct of the study with two Thailand-based institutions. Gahol said Basic Energy signed the contract on Thursday with Alternative Energy Institute of Thailand and Ethanol Thai Ltd., a research and technology institute. “The service fees for providing the feasibility study is for a lump-sum amount of $60,000,” Gahol added. To be put up on a 25- to 30-hectare site in Batangas, the company’s integrated bioethanol plant is estimated to have daily production capacity of 300,000 anhydrous bioethanol liters. It is scheduled to begin commercial operations by 2011. The planned facility will make use of cassava chips as feedstock, which will be sourced from the company’s subsidiary, Basic Ecomarket Farms Inc. Basic Ecomarket has an ongoing cassava plantation project that targets to produce dried cassava chips from around 20,000 hectares in the Zamboanga peninsula—and later on, in Bohol—under a combination of corporate-farming and contract-growing arrangements. Parent firm Basic Energy has earlier infused in its subsidiary P31.12 million in additional equity investment to fund the cassava project. Basic Ecomarket also signed last month a memorandum of agreement with India-based Trio-Chem Group of Companies, which has committed to invest as much as $500,000 in the cassava plantation project. Trio-Chem is a technology and equipment supplier of clean environment and sustainable development projects and processes. According to Gahol, the agreement would also establish a business relationship between the parties for the development of an integrated feedstock farm and bioethanol plant and related facilities in the Philippines. Basic Energy also owns Zambo Norte BioEnergy Corp. (ZNBC), which is the company’s initial foray into alternative energy.